February is a good time to visit San Diego, as winter starts to wind down and before the crowds arrive for spring break. Hotel rates are lower than they will be through spring and summer. February isn't the time to go if you want to spend a lot of time at the beach. The water gets so cold that time of year that not even the locals want to go in. 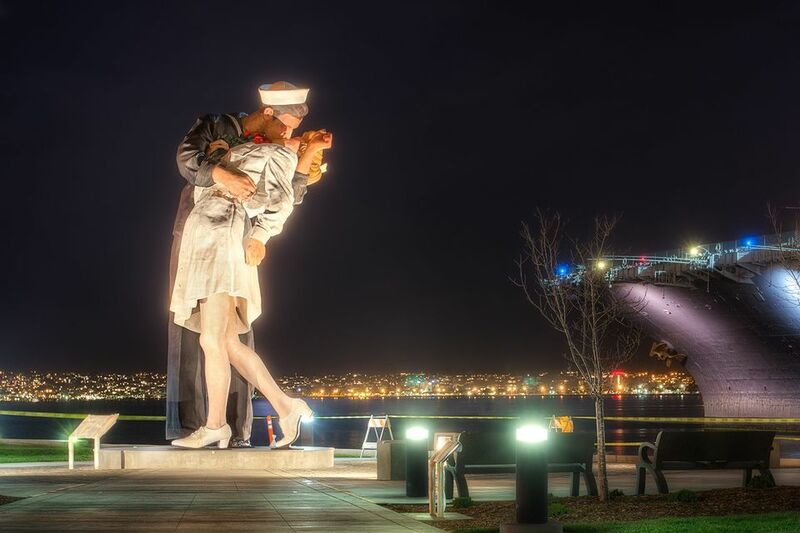 If you're thinking of San Diego for a romantic Valentine's Day getaway, check out some of the most romantic spots in San Diego. People sometimes ask whether it's cold in San Diego in February and sometimes they even want to know whether it snows. The last measurable snowfall in the city fell in December 1967. Is it cold? That depends. San Diegans might think so, but if you're from a colder climate, you'll probably think it's just right. February is also one of San Diego's rainiest months, with some of the most unpredictable weather of the year. Instead of raining a little bit every day, the entire monthly rainfall often comes all on the same day, especially during winter storms. If precipitation happens, try these things to do on a rainy day in San Diego. You may get some more ideas about things to do in the guide to San Diego in the winter. Use the averages when doing your long-range planning, but check the San Diego weather forecast before you leave home. Pack an umbrella or rain jacket with hood for rainy days and a warm jacket if no rain is predicted. A scarf or shawl is also a good addition to the packing list. You won't need a thick winter coat. Long-sleeved shirts and sweaters in layers work best. Pack flat-soled shoes if you plan to visit the USS Midway. They'll make your visit much safer. And if you plan to go across the border into Tijuana, take your passport. You won't get back home without it. Whale Watching: San Diego whale watching season runs from December through March. To learn more about California whale-watching and San Diego excursions use the San Diego whale watching guide. See the Wildflowers: You'll have to drive about two hours from San Diego to Anza Borrego Desert State Park, but the spectacular sight of wildflowers blooming in the desert can be well worth it. Check the current status before you go. All you have to do is sign up for a free account with Goldstar to get access to discounted tickets for performances. Goldstar can also help you save money on some San Diego attractions. Even better, it's just as useful when you're at home as it is when you're visiting San Diego. San Diego Museum Month: when admission to more than 40 museums is half off. Winter Brew Fest: Besides sampling lots of great local microbrews, you can enjoy some good music and food. Gaslamp Quarter Mardi Gras: The date for Mardi Gras changes every year. More than eight times out of ten, it happens sometime during February and the Gaslamp's celebration is one of California's best Mardi Gras events, with two parades and a masked ball. With winter rains lingering through the month, it's an excellent time to enjoy some of the city's indoor attractions. See the leafy sea dragons at the Birch Aquarium in La Jolla. Head for the waterfront to tour the USS Midway Aircraft Carrier and get a taste if life is like on the flight deck — or go to Balboa Park and browse one of its excellent museums. Hotel occupancy is low in February, making it a good time to find lower hotel rates. The day after it rains, skies are sometimes exceptionally clear and great for photography.